On Monday, 30 April Royal Mail will change its prices. The price of a first-class stamp will go up from 46p to 60p - a 30% increase - and second-class stamps will rise from 36p to 50p. But the changes are less clear-cut when it comes to packets and parcels. In some cases, prices will go up by 71%; in other circumstances they could also go down by 11.5%. At the moment, Royal Mail charges for packets according to how much they weigh. Anything less than 100g currently costs £1.58 and an item between 501-750g is £3.05. But from Monday, this system is being replaced by a flat rate. From then on, anything up to 750g will cost £2.70 and that means an increase of 71% for the lightest items. James Turner says this is bad news for him. He runs a one-man business, selling wooden stands for smartphones and tablet computers. 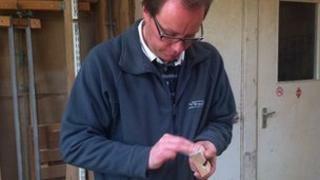 He sends about 50 parcels a month to online customers and includes free delivery in his prices. His phone stands weigh less than 100g, so they currently cost him £1.58 each to send. From Monday, his prices will automatically go up to £2.70 for the same items. "The packets are going to cost me an extra £1.12 to send, so I'm having to pass on prices to my customers to cover that difference," he explains. "It's very annoying that I've been put in this position. I don't feel that I've got a choice other than to use Royal Mail." Robert Hammond, who speaks for Consumer Focus, says these changes will hit the "most vulnerable, hardest - particularly older people and those on low incomes who rely more on the postal service and have fewer alternatives". He adds: "Although second-class prices are also rising significantly they are not rising as much as first-class. "So we would encourage consumers to try to post packets in advance by second class wherever possible." The regulator Ofcom is allowing Royal Mail to put its prices up, because it says the service is at "severe risk". Nowadays more of us rely on texts and emails instead of popping down to the post box to send a letter and Royal Mail has lost almost £1bn over the last four years. A Royal Mail spokesperson said that kind of loss was "not sustainable for any business". It says the average increase for packets is 15% and it believes that jump is justified. "The changes better reflect the cost of handling packets which often cannot be delivered through the letterbox," the spokesperson said. "Royal Mail is committed to supporting social and business customers who send packets. "For the typical consumer and small business customer, we will remain the cheapest provider of packet services in the country." Postal consultant David Stubbs says that is true, especially for smaller packets. He explains that they can be delivered straight through your letterbox by a postman who is going past your door anyway. So Royal Mail can afford to deliver smaller packets more cheaply than a courier service who would have to make a special journey to your door. "I think Royal Mail are doing this precisely because most people who are sending parcels around the £2 or £3 mark don't have a choice," says Mr Stubbs. "They are the only provider that will offer a service at this sort of price. "If you're sending something around £3 or £4, then you will have alternatives - have a shop around," he urges. However, Mr Stubbs warns that this will not always be the case. Other providers and couriers are doing as much as they can to close the gap, and he predicts they will manage that in the next two or three years. Which country has the most expensive postal charges?